Multi-link floating arm structure design efficiently shortens tool change time and reduces the vibation. Build-in sensor with high distinguishable signal light is designed for easy maintenance. Light weight aluminum alloy but rigid structure of magazine body and tool disc decrease magazine rotating inertia and spindle inertia load. High toughness compound gripper protects spindle during tool change. Individual unit design on grippers allows easy replacement after long period of use or consuming. X and Y axes rapid feed rate are 48 M/min, Z axis is 60M/min. New disc tyoe ATC remarkably shortens sensor reaction time. Tool change time is only 1.6 sec(T-T), 2.5 sec(C-C), 2.8 sec(Opposite Side) by servo motor. (For inverter motor, tool change time is 1.8sec(T-T), 2,8 sec(C-C), 3.5 sec(Opposite Side)). Rigid casting design provides sufficient rigidty during high speed movement and heavy cutting which is not only suitable for drilling and tapping but also for engraving and milling. With new type Mitsubishi low inertia spindle motor, spindle response tiem is grately shortened. It takes only 1.0 second for spindle to run up to 12000 rpm from 0 rpm. 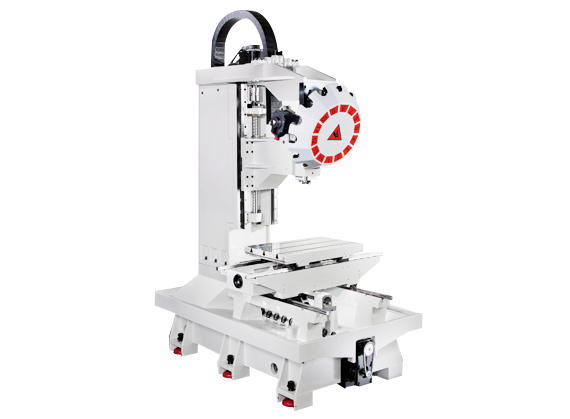 During continuous and repeating acceleration or deceleration rigid tapping process, spindle speed cooperates with 3 axes rapid movment and can greatly shorten machining time and improve machining efficiency. Full enclosed indexed cam structure ensures the stability of the parts in ATC which prvents the dusts and mists generated during the machining. Servo motor and inventer motor for ATC rotating position are both available. Transmission is high precision ground gear. Spindle nose to table surfacce 6.7"x20"
Spindle center to column surface 18.1"
T-Slot (Size / Qty / Dist.) 0.6"x3x4.7"
Rapid feed rate of XYZ 1.9" / 19" / 2.4"
Cutting feed rate 472.4 inch / Min. Dimension 63" x 84.6" x 91.3"